This packet is for the Rock Art Center that is student directed. 1. There is a sign to print for the outside of the classroom Rock Art box full of supplies or to use as an area center sign. 2. 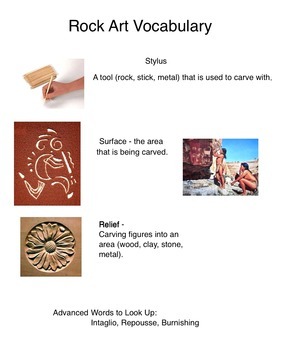 There is a Rock Art vocabulary list that I have the students copy into their sketchbooks. There are advanced words for further study. 3. There is a Rock Art Center procedure list that the students follow to set up and clean up. Since most of my centers are open-ended, I do not include a specific project in the packet. This packet basically covers the operations of the center. The students decide what they want to create, and if you assign a theme to the whole class, their art will include the theme as they envision it. https://www.jurassicsand.com/ I did this activity with my 3rd graders and they loved it! I will have a store product for each of my different art centers. There is also a packet that has folders for 8 different art centers that I use in my art room (25 pages). 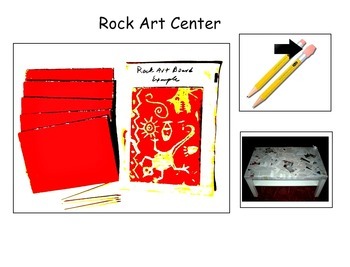 Since Rock Art is a new center for us, it is not included in the bundle. Any questions, please ask. The pages are editable if you open them in Paint or Paintbrush. I teach k-5 ELL students. My worksheets are open-ended so my students can experience success in both art and English. If you have any questions, please contact me. And, If you are unfamiliar with Open-Ended art activities, please download my free "Open-Ended Art is..."